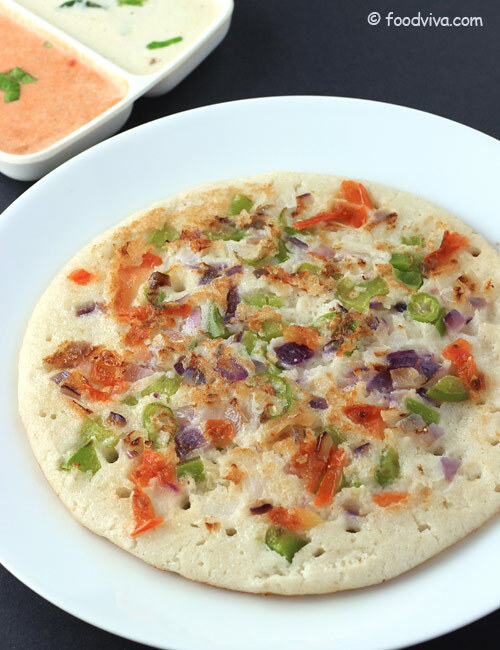 Uttapam (aka Uttappa or Oothapam) is yet another healthy breakfast recipe from South Indian cuisine prepared with a common rice and urad dal batter used for preparing Idli and dosa. However, unlike Dosa, Uttapam is little thicker and is topped with different types of veggies like onion, tomato, capsicum, carrot, green chilli, sweet corn etc. which makes it even more healthier and tastier. Similar to idli and dosa recipes, you can prepare Rice and Urad Dal batter in advance and use it over multiple days to make delicious Uttapam in just 20 minutes for the breakfast. 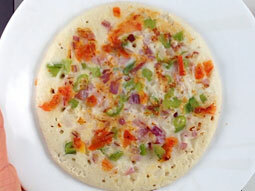 This Uttapam Recipe explains entire process with step by step photos and provides tips to give it a personal touch by choosing your favorite vegetables or make it like a pizza by garnishing it with grated mozzarella cheese. Prepare the batter at home by following this recipe or buy the readymade batter from the grocery store. 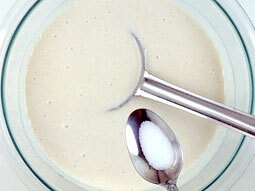 Add salt (if not added before fermenting the batter) and water (if needed) in batter; mix well. 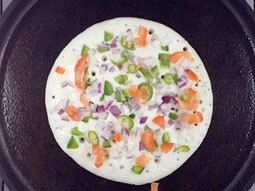 Batter should be slightly thicker than dosa batter and slightly thinner than idli batter. 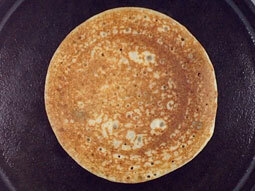 Heat cast iron tava (dosa tawa) or non-stick tawa over medium flame. (for nice golden color, we recommend to use cast iron tawa.) Add few drops of oil on hot tawa and spread it using a halved potato or a halved small onion. 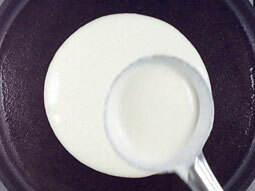 This process helps spreading of batter and also prevents it from sticking. Repeat this process before making each uttapam. When tawa is ready, pour one laddle batter and spread it in round shape by gently rotating the ladle in clockwise or anti-clockwise direction. make sure that batter spread is slightly thicker than a batter spread for Dosa. Sprinkle 1-2 tablespoons finely chopped onion and 1-2 tablespoons finely chopped capsicum over it. Sprinkle 1 tablespoon finely chopped tomato and finely chopped green chillies over it. Gently press the veggies with a spatula. Cook for approx.2-3 minutes until bottom surface turns light golden brown. 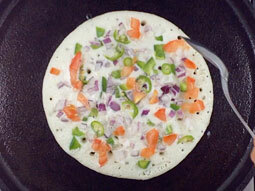 If you are making very thick uttapam, cover it with a lid to speed up the cooking process. Transfer it to a plate. Repeat the process from step-2 to step-8 for remaining batter. Serve it hot with coconut chutney or tomato onion chutney. The batter spread should not be very thin otherwise veggies will not stick with batter. 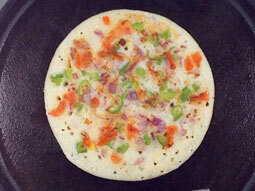 If batter is refrigerated, remove it from the refrigerator at least 30 minutes before making the uttapam. 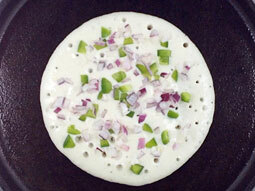 Sprinkle only onion and green chilli to make Onion Uttapam. If you are making it for kids, garnish it with shredded or grated mozzarella cheese to give it a tempting Pizza look. 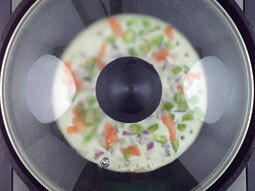 Add vegetables of your choice and according to the availability. Add grated carrot, sweet corn, green beans etc. to enhance its flavor and taste. 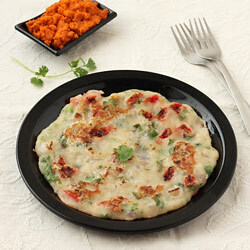 Serving Ideas: Serve it hot with green coconut chutney and vegetable sambar for breakfast or as a light evening dinner. Great recipe! Worked out perfectly. Thank you for the wonderful narrative and pics- it was very easy to follow. Understandable language of recipe that is nice.